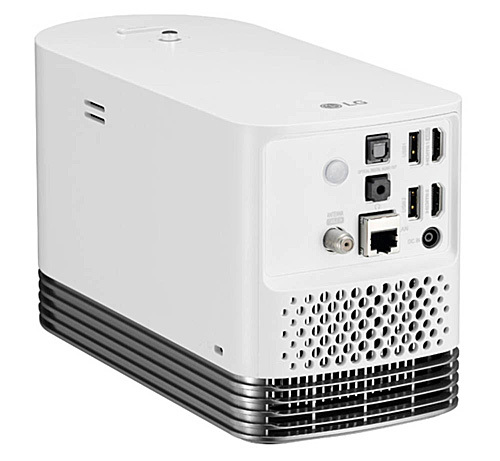 The LG Electronics HF80JA Smart Laser Projector is the latest of LG's innovative combinations of smart TV and projector. Think of it as a portable 90" flat screen HDTV. You can use either in traditional home theater or as a living room entertainment projector. It is basically a smart TV that uses an HD 1080p home theater projector as its display. At only 4.6 pounds, portability is a key benefit of this projector. You can use it in a variety of portable settings (home theater, back yard movie night, a neighbor's Super Bowl party, etc.). It is bright enough to throw a huge ten-foot diagonal picture in a dark room. It can also light up a 90" screen in a room with some ambient light, giving you the equivalent of a 90" flat panel HDTV in your family room for a lot less money. The LG HF80JA has a laser light engine with a 20,000-hour lifetime, so you'll never have to buy a replacement lamp. As one of the least expensive laser-based projectors on the market, it is a unique bargain at $1,349.99. The TV side of the package includes basics like a coax connector and TV tuner, so you can connect a cable or antenna and change channels without a set top box. Beyond that, the LG Smart TV menus include links to Vudu, NetFlix, an App Store, and a Web browser with predefined links to popular sites like YouTube. Also included is LG's Magic Remote, which acts as either a standard remote or an air mouse--whichever you prefer--for controlling both the Smart TV and projector menus. It even doubles as a universal remote to control a set top box. The LG HF80JA's image quality is easily a match for most HDTVs and low-cost home theater projectors. There are no leading edge home theater features like 4K or HDR, and there is no 3D. but the image quality can stand toe to toe with most 1080p displays for film and video. The settings menu--as distinct from the LG Smart TV menu--offers seven customizable, predefined color modes: Vivid, Standard, Cinema, Sports, Game, Expert (Bright Room), and Expert (Dark Room). In a side-by-side comparison with a calibrated projector, the default settings for each mode show a slight green bias, with Vivid--the brightest mode--showing the most bias and the two Expert modes showing the least. Even with Vivid, however, color reproduction is within a range that looks reasonable and natural. Without a calibrated projector to compare to, you're not likely to notice a color bias. You can also improve color fidelity in every mode simply by changing Color Temperature from Medium to Cool. This gives both a smaller shift from precisely accurate color in each mode and changes the shift from green to blue, which most people find more acceptable in any case. For more demanding users, the two Expert modes offer more advanced picture controls, including Color Gamut, Gamma, and White Balance as well as the ability to adjust Saturation, Tint, and Luminance separately for red, green, blue, cyan, yellow, and magenta. Despite the rated 150,000:1 contrast ratio, the HF80JA does not have the deep black levels and shadow detail definition that you get from larger, dedicated home theater projectors. So we would not recommend it for permanent installation in a dark theater room where you would not take advantage of its portability. However, it is certainly ideal for occasional use in this setting on screens up to 120" diagonal. Due to its exceptional 20,000 hour life, the HF80JA can easily double as a family-room TV or back yard projector where there is likely to be some ambient light. In settings like this the ideal picture size would be 80" to 90". The ambient light will neutralize the black level issues, and allow the HF80JA to deliver a solid and engaging picture for a very attractive price. 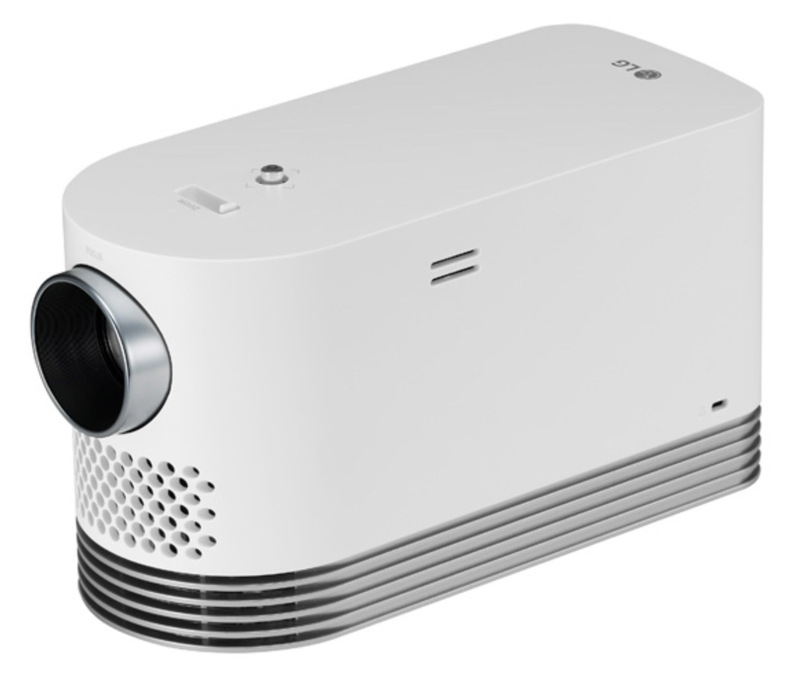 Due to its portability, the LG HF80JA can also double as a presentation projector at the office. With presentation graphics, as well as animated film and video, colors are vibrant and the HF80JA holds detail well. Both white text on black and black text on white are easily readable at sizes as small as 5 points. Brightness. The 2000-lumen rating for the LG HF80JA comes with an asterisk. Starting from the observation that colors produced by lasers are perceived as being brighter than colors from lamp-based projectors with the same measured lumens. So the company bases its lumen rating on what LG says a lamp based projector would measure with the same perceived brightness. Therefore the actual metered lumens will always be lower than lumen specs that have been adjusted with "equivalent perception" in mind. We measured the brightness at 1089 lumens based on a center spot reading and 957 ANSI lumens. As is typical, the ANSI brightness is lower than the center spot reading because it averages measurements from nine points in the image. The measured ANSI lumens for each predefined color mode is as follows for the three different Energy Saving modes. ANSI Lumens in three "Energy Saving Levels"
Low Lamp Modes. Compared with Minimum Energy Saving mode, the Medium mode is 90% as bright, and the Maximum mode is 79% as bright. Video Optimized Lumens. Expert (Dark Room) offers the best overall video quality and color accuracy, after some slight adjustments, at a hair under 600 lumens. Based on the usual rule-of-thumb recommendations, that would make it bright enough for a 70" diagonal image in moderate ambient light, but we found it easily bright enough for an 80" image. For larger images or brighter rooms, even the brightest modes--Vivid and Sports--offer quite usable video quality, although the default settings for those modes are a little over sharpened for film. Presentation Optimized Lumens. For presentations, Vivid mode with default settings delivers eye-catching color for graphics. Adjust sharpening to a lower level and switch the Color Temperature to Cool, and it can handle presentations with photo, video, and film clips nicely as well, while still delivering 884 ANSI lumens. Zoom Lens Effect. The 1.1x zoom is not enough to curtail light significantly at any setting. Brightness uniformity. We measured the brightness uniformity at 78%. The variation is enough to see on a solid white screen but not with any image that breaks up the field of view. Fan noise. The HF80JA's fan noise is remarkably low for this small a projector. Even better, the steady, moderate-pitch sound tends to fade into the background unless you make an effort to listen for it. In a traditional home theater, it could be audible in quiet moments from a few feet away at Minimum Energy Saving mode (rated at 30 dB), and Medium mode (28 dB), but almost inaudible from two feet in Maximum mode (26 dB). In a family room with the typical ambient noise of a house--from ceiling fans overhead to refrigerators running in the background--it is hard to believe anyone would notice the sound in any of the modes. Lamp Life. The rating for the laser light engine is 20,000 hours. Warranty. A 1-year warranty for the projector and light source is included in the price. Whether you install the HF80JA permanently or carry it from room to room as needed, the 5.5" x 4.3" x 9.9" size and 4.6 pound weight make setup far easier than with a big-screen TV and somewhat easier than with a larger projector. Even better, the 1.1x zoom, automatic vertical keystone correction, and manual four-corner control is enough to let you place the projector in approximately the right position, then adjust the image size and geometry without having to move it again. The throw distance for a 90" 16:9 image ranges from roughly 9 to 10 feet. You can find the range for the image size you want using the Projection Calculator. The lens offset puts the bottom of the image above the centerline of the lens by about 5% of the image height. Two USB A connectors let you connect a USB mouse, keyboard, or gamepad as well as show files directly from USB memory. Sound. The built-in pair of 3W stereo speakers offer sound quality that's easily good enough to be usable at high enough volume to fill a small family room. You can also connect an external sound system to the 3.5mm or optical audio outputs or by Bluetooth. A built-in AV Sync feature lets you adjust for audio delay. Wireless Connections. 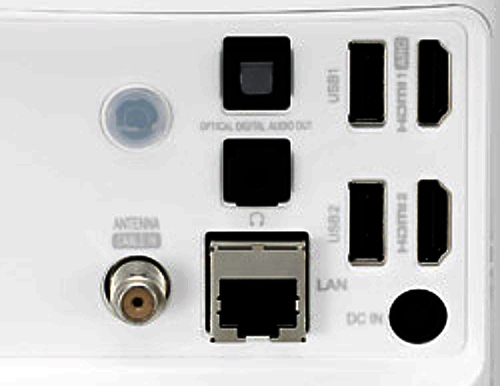 In addition to two HDMI ports for input and an RJ-45 for connecting the LG Smart TV to your LAN, the HF80JA offers a number of wireless connection options, including standard Wi-Fi for connection to a network and support for Wi-Fi Direct, Miracast, WiDi, and DLNA for connection to individual devices. No VGA. Although it won't matter for most people, the lack of a VGA connector means the only way to connect a computer that lacks an HDMI port is wirelessly. Overly directional remote. The only position I could find to give commands reliably by pointing the remote at the screen is from directly behind the projector. From even a few degrees left or right, commands are more often ignored. I wound up pointing at the projector instead, which can take awhile to get used to. Slow menu response. Even when the projector responds, it can take a long time. One of the settings menus, for example, never takes less that 5 seconds to open, and sometimes takes longer. The highly portable LG HF80JA is a rare combination of smart TV and native HD 1080p projection for multi-purpose video display in a variety of settings. You can easily move it from a dark theater room to family room, to back yard, or even the office. It is easily bright enough for a 120" image in a dark room or a 90" image with moderate ambient light; it delivers high quality 1080p images for film and video. Its small size, low weight, and four-corner correction make it easy to set up, and its 20,000-hour laser light engine make it virtually maintenance free. Beyond all that, at $1,349, it is downright inexpensive for a laser projector and easy to recommend. I understand that for normal projectors keystone will distort/influence the image quality greatly. But for laser ones, they seem to be always on focus and some people says the mount position is not important anymore. I am wondering if the distortion from keystone on laser projectors will be much less(better) than traditional projectors. Let's say if I would like to do about 20 degree(0 degree means totally perpendicular) from the perpendicular plane, how bad it could be? Xing, keystone adjustments themselves have nothing to do with focus, and whether the projector is lamp or laser makes no difference. Keystone adjustments compress the image on the chips from rectangular to trapezoidal in order to compensate for (or neutralize) the trapezoidal optical image you get if you do not project on a perpendicular plane. Keystone adjustments are often very handy and they don't mess up the image that much. The reason folks like to avoid it on a 1080p projector is that it eliminates the ability to achieve a one-to-one pixel match between a native 1080p source and the 1080p imaging chip in the projector. So it very slightly softens the image because it compresses the signal a little bit. However, it is often difficult to see the difference in video. The other downside to keystone is that it can cut the light output of the projector. A minor adjustment won't affect it much, but if you do an aggressive keystone of 20% or more it may begin to cut light output enough to make it noticeable. A grey screen will help with the pic for this projector. Hello, I am planning to buy a LG Projector. But I am afraid of rainbow effect. Should I? Thank you in advance. Murat, regarding rainbows, we cannot predict whether you will notice or be bothered by rainbows. Some people see them, some people never do. The good news is you can buy it from Amazon, and if you find rainbows to be a problem you can return it for a refund. It is easy to check it out and see for yourself. Is this projector a one-chip DLP or a three-chip? Che, it is one-chip. Three-chip DLPs are larger and much more expensive. Will this projector serve well in church service where there's a lot of light? Tim, selecting any projector would require more information to assess what constitutes "a lot of light" -- how truly bright is it, is the light positioned in such a way that it directly washes on the screen, etc. You'd also need to know how large an image you plan to project, and what type of screen material is being used and whether it is a special material that rejects ambient light. We normally recommend bringing in a A/V professional to make the right recommendations for a particular environment like this. That said, I can say with some confidence that this particular model, which measured less than 1,000 lumens in its brightest mode, would not be the best choice for a high ambient light environment. I wish you would measure black level in these reviews- The most telling aspect of picture quality.